Avonmore Books is an Australian publisher specialising in military and aviation history, with a particular interest on the early period of the Pacific War. Avonmore prides itself in being the only mainstream Australian military history publisher producing full colour, illustrated books. While expensive to produce, we strive to produce titles that are a pleasure to own and read, and which incorporate first-class profiles, illustrations and maps. Our key authors have unique backgrounds. These include Darwin-based Dr Tom Lewis, a former naval officer who is an expert in Northern Australian military history. Another is former diplomat Michael Claringbould, raised in Port Moresby, whose knowledge of both the New Guinea conflict and Japanese aviation is recognised worldwide. The proprietor of Avonmore Books is Peter Ingman, who began his writing career as co-author of the best-selling Zero Hour in Broome in 2010. Readers are welcome to contact Peter via peter@avonmorebooks.com.au or +61 412 602380. For latest news follow Avonmore Books on Facebook. 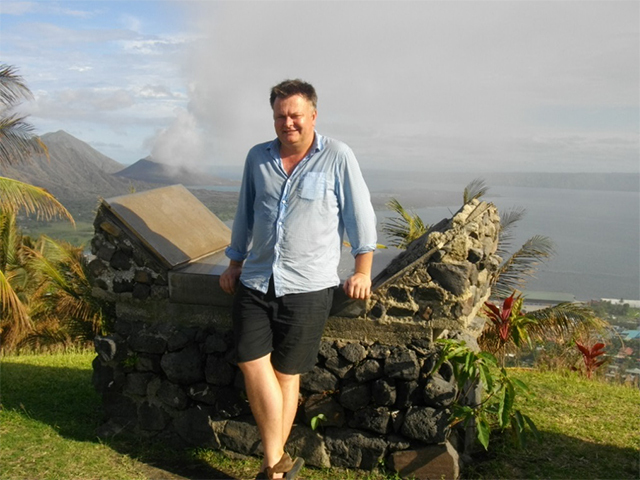 Peter Ingman at the Rabaul Observatory in 2013.